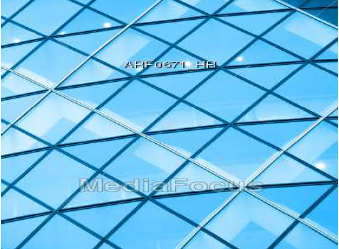 Building design today tries to maximize the percent glass of the envelope. The "outdoor type" working-living environment increases the productivity of its occupants which also saves energy. The first costs, construction costs and building maintenance operating costs (robotic window washing of the smooth outside surface, etc.) of glass high-rise buildings are low. The construction time is short because sections of the building envelope are manufactured away from the site and assembled at the site. 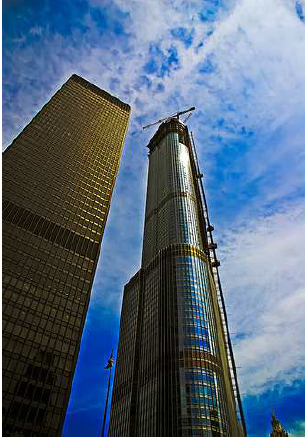 I watched the Trump Tower in Chicago being completed in less than two years. The glass panels were hoisted up to each floor and the construction crews worked from the inside to snap it into place. Glass buildings are lighter and therefore today's choice for all types of commercial high-rise buildings. Some buildings are entirely steel frame and glass envelope cladding. The main source of energy savings of a glass building is day-lighting. The glass could have PV properties which generates electricity. The source of this energy is also daylight. 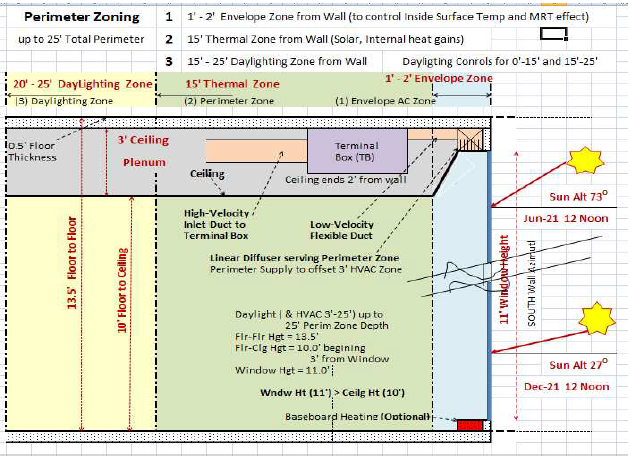 Because ASHRAE Std90 requires a perimeter zone depth of 15 feet for HVAC , it also means that you cannot get the full day-lighting credit for energy savings in buildings with high percentage of glass. 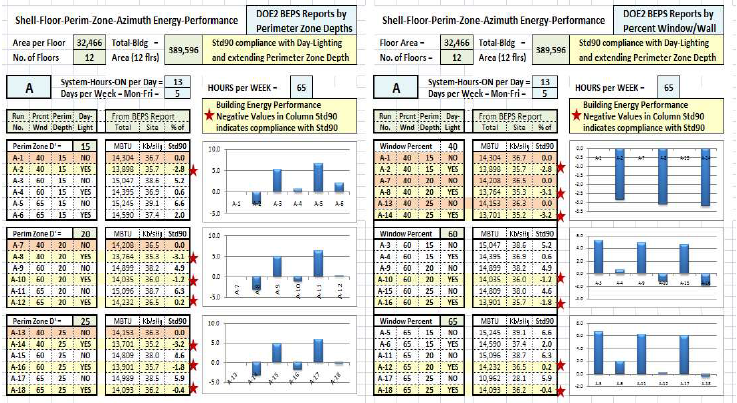 Perimeter Zone Depth for Energy Code Compliance should be extended to 20 feet and up to 30 feet or more depending on ceiling and glass height, gross window percent (from floor to floor) and net window percent (from floor to ceiling level). The savings from day-lighting estimated from the computer modeling can be confirmed during the Measurement and Verification (M&V) stage. A better and cheaper method of verification would be to walk into one of the numerous glass buildings of all types built recently and check for yourself. Note that the blinds cover half the glass of Crown Hall in the picture, but Day-Lighting covers the entire floor. 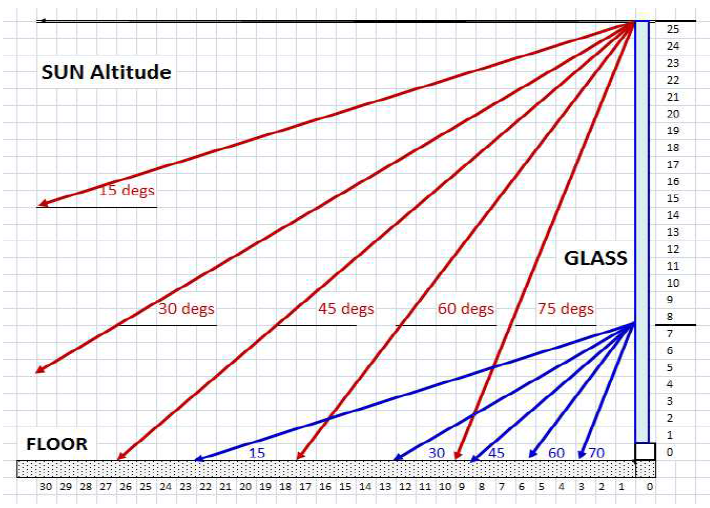 The Day-Lighting Zone depth depends glass height net percent glass area. The space (0 to 3 feet) from the building shell should be treated separately in extreme winter and summer climates. This is the Envelope Perimeter Zone. Cold climates require perimeter heating and, in the past, it was located at the floor level (heat rises) to prevent cold air downdrafts caused by the cold envelope inside surface. Cooling systems at the floor level are not effective since cold supply air flows down and would stay at the floor level. Cooling is typically supplied from the ceiling. It could be located away from the envelope for outdoor temps less than 100oF. In climates where outdoor temps exceed 120oF with high solar radiation on the outside, the inside surface temps of inefficient envelopes can be high and cause discomfort due to the Mean Radiation Temp (MRT) effect if there is no dedicated perimeter cooling system. With efficient envelopes (ASHRAE Std90 and codes have made it mandatory), the envelope zone can be treated with the supply air located at the floor or ceiling, for heating and cooling, to maintain the envelope inside surface temperatures. Std90 envelopes do not require finned tube or electric radiation at the floor of the perimeter edge for heating which affects the furniture layouts of this prime property space at the perimeter. With Std90 envelopes, the heating and cooling supply air can be from the floor or ceiling at the perimeter edge serving a dedicated envelope perimeter zone of 1 to 3 feet. Supply air for cooling can now also be from floor lever and supply air for heating can also be from ceiling level. Both cases would require a minimum discharge air velocity. Presently DOE2 based programs do not report the inside and outside surface temperatures of the exterior envelope constructions. 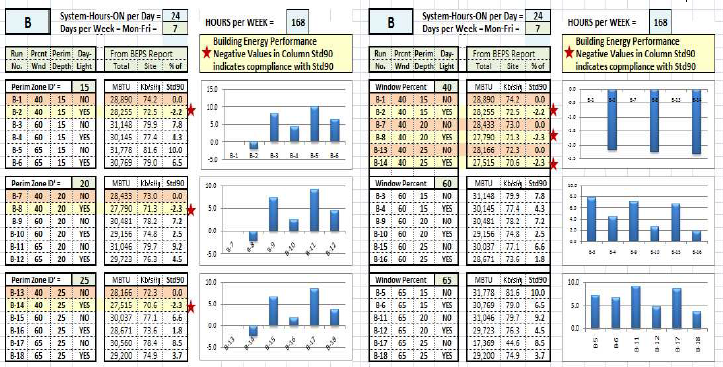 The DOE2 program does calculate the outside surface temperature for the wall (can be viewed only in hourly reports) but not the inside surface temps which can be calculated independently by transferring the inside hourly data to an Excel spreadsheet. 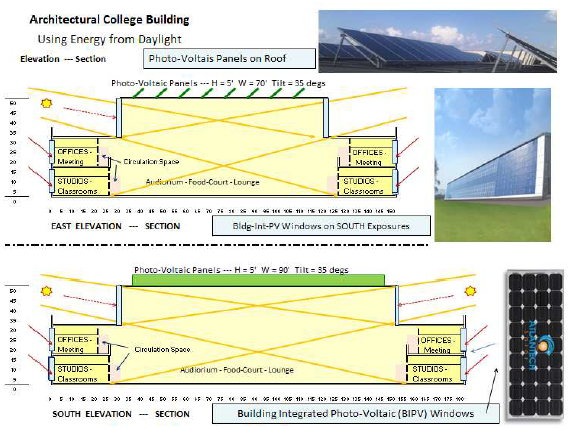 Energy (and loads design) programs should calculate and report envelope inside and outside surface temperatures and should calculate Mean Radiant Temperatures at two user specified distances from the inside surface of the envelope. When and how was this perimeter zone depth of 15 feet established which applies to all types building designs, configurations and envelope constructions? Day-lighting depends on the height of the ceiling (and glass) and the window percentage area. The day-lighting zone depths for 40% gross glass area (Std90) and 90% gross glass area (floor to floor glass with no ceiling) are different. Net percent glass can be as high as 75% which allows solar radiation heat gains and day-lighting to reach depths of 30 feet and more depending on glass height. 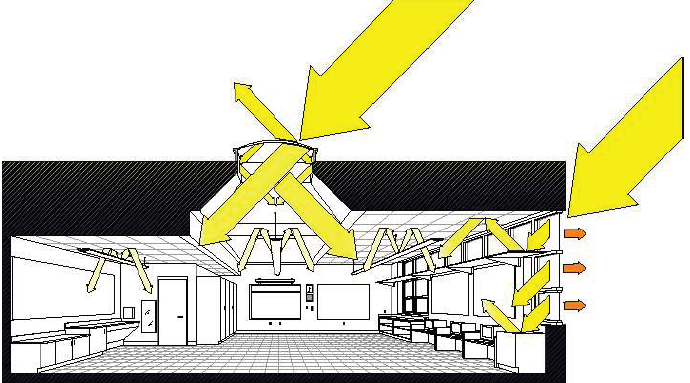 Light shelves with reflective ceilings also extend the day-lighting perimeter zone. Day-lighting analysis should estimate day-lighting levels separately for 0-15 feet and 15-30 feet depths segments and there should be separate lighting dimming controls for the two segment. 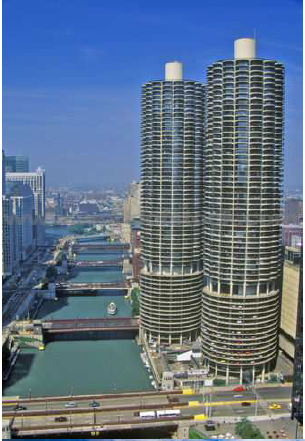 Example: A residential building in Chicago (Marina Towers) occupying the space between State St. on its east and Dearborn St. on its west. The Chicago river and Wacker Dr. separates the Marina Towers from the tall buildings downtown. There are 20 feet semi-circular 20 feet diameter balconies on each floor. The walls are all glass except the door to the balcony. Units facing south on floors as high as 50, do not get direct sunlight because of the tall buildings of downtown Chicago (not because of shading from the balconies). Night-lights with light sensors along the kitchen back wall do not go on during the day because indirect day-light. Artificial light is not used beyond a zone depth of 15 feet during day-light hours in apartments and hotel rooms. Solar radiation heat gain does not stop at an imaginary perimeter zone depth of 15 feet either. During winter in a residential building in Minneapolis (45deg N. Latitude) facing Southwest with 9 feet floor to ceiling height and almost 100% glass walls, the sun travels almost horizontally in winter, across the living and dining spaces, and reaches the back wall of the apartment (kitchen and entrance areas) that are 30 feet indoors. It heats the back wall and the kitchen appliances first by radiation and from there, through conduction and convection, the spaces near the perimeter are heated. However, most of the effect of solar radiation in summer and winter is within a 15 feet perimeter zone. 12 feet was used by some designers in the past before the 15 feet rule was introduced. This thermal perimeter zone includes solar and internal loads and is also affected by day-lighting. If the Envelope, Day-lighting and Thermal zones are combined into one Perimeter zone then a 20 feet (instead of 15 feet) perimeter depth is more appropriate that would cover all cases . The figure shows a glass-walled office building that demonstrates the concept of three zones (see section). This is typical of the new high-rise office buildings. 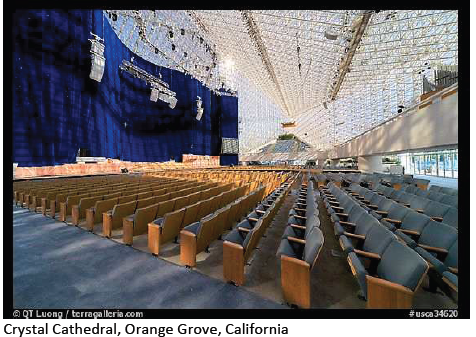 (3) an additional day-lighting zone beyond 15 feet which would include interior loads. Separate day-lighting controls would be provided for lights from 0 to 15 feet and for lights from 15 to 30 feet. The figure also shows that a 13.5 feet floor to floor height can have up to 13 feet glass height (0.5 ft for the floor slab). The ceiling can slope away under the bottom of the floor above to 10 feet above the floor which leaves about 3 feet plenum space. The ceiling could start from 2 or 3 feet away from the exterior wall. Both building types cases exist today, allowing for up to 90% gross window area. There should be an option to specify 2 or even 3 perimeter zones. The first is a envelope zone which could be less than one foot deep. The HVAC system has to treat this zone separately to offset thermal transmission loads based on outdoor air temp and solar radiation on the outside surface and to prevent discomfort due to MRT from the inside surface temp. This applies to extreme winter and summer climates only. The second would be a thermal zone for the solar loads and internal heat gains and the day-lighting effect on artificial lighting. The envelope and thermal zones can be combined because the envelope is treated separately anyway depending on the climate and construction. The third perimeter zone is for the day-lighting effect on lighting. This depth of this zone could be anywhere from 15 feet (applies to 40% glass as required by ASHRAE Std90) and up to 30 feet or more depending on the envelope glass height and net percent window. 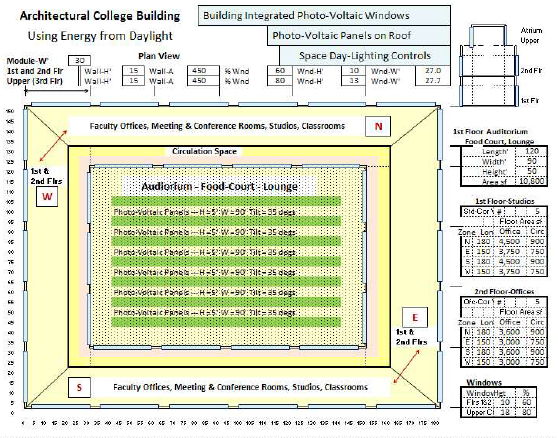 Separate bank of lights and daylighting controls are required for the space beyond 15 feet. The envelope and thermal zone can be combined into one zone and could be between 15 feet and 20 feet depending on the climate. Anything greater in cold climates would result in the internal heat gains cancelling out the external heat losses resulting in no heating in winter. 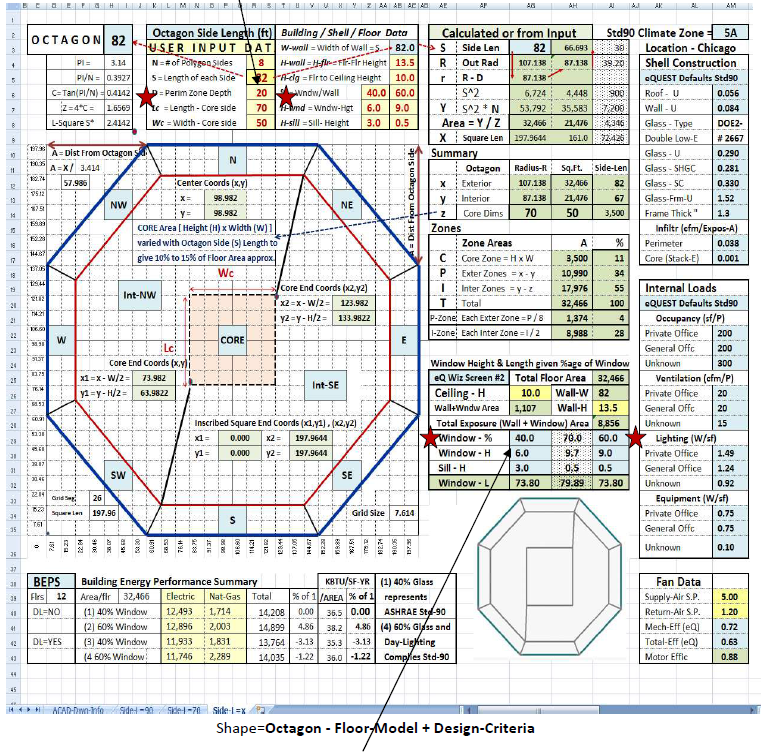 This occurs with Energy Analysis programs only but not with Design Loads programs which do not consider internal heat gains for heating calculations because there could be times when the internal heat gains are low or zero. If the Envelope, Thermal, and Day-lighting zones are combined and for all types of buildings, then a standard perimeter zone depth should be 20 feet. ASHRAE Std90 envelope is based on climate zones and varies. The Perimeter Zone Depth should also vary depending on location, climate and building design configuration. One size does not fit all. 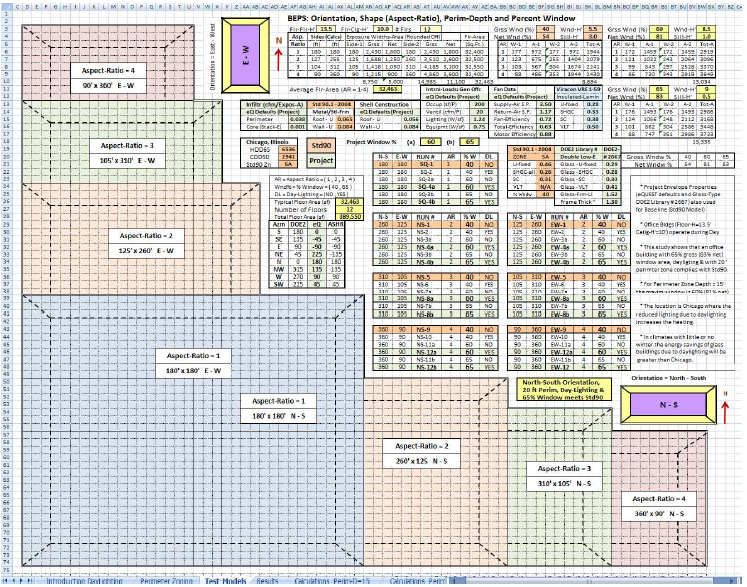 (1) "BEPS -Rectangle - Orientation, Aspect-Ratio, %-Window"
(2) "BEPS -Octagon - Azimuths, Perim-Zone-Depth, %-Window"
Number of floors = 12;. Type of plant (1 each of centrifugal-chiller, cooling-tower and gas-boiler). The location is Chicago where the reduced lighting due to day-lighting increases the heating. In climates with no winter like Singapore, the energy savings of glass buildings will be greater. There was no external shading consisting of overhangs, fins and balconies. These add to the first, construction and maintenance cost and the appearance of the new glass high-rise buildings. It reduces the energy savings from day-lighting. In cold climates they increase the heating energy. 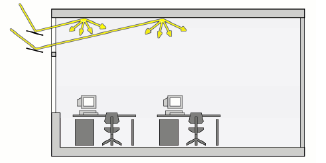 The study shows that an office building with 65% gross (83% net) window area, day-lighting and with Perimeter Zone Depth = 20 feet just complies with Std90 (15 feet zone depth and 40% window). 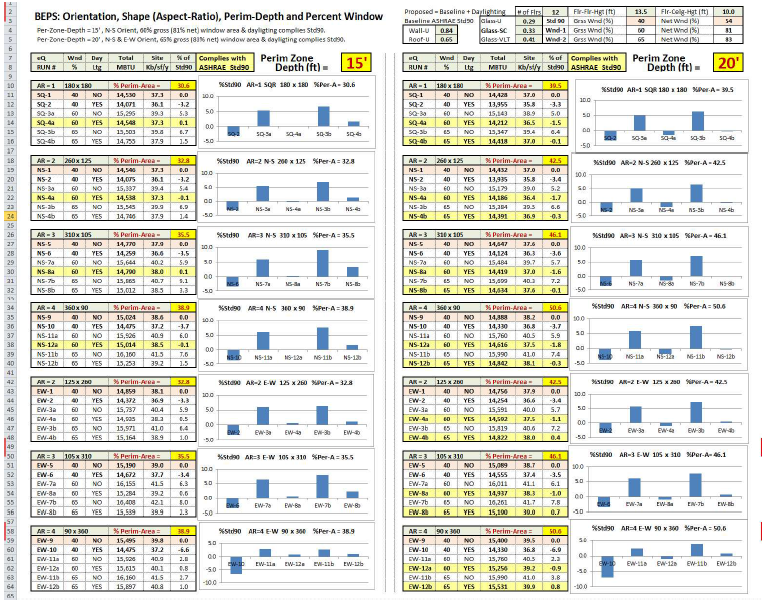 For Perimeter Zone Depth = 15 feet, day-lighting the maximum window is 60%. 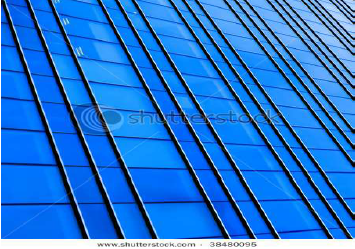 The rectangle building study shows that based Std90 envelope, the energy savings by architectural design (adjusting the building shape, floor aspect ratio, percent interior area, orientation and azimuth) is small. If the envelope has to comply with Std90 then architectural design methods are not going to save energy. If the envelope complies with Std90, then day-lighting is the main (and only) method of saving energy with architectural design. Increasing the percent glass can provide day-lighting for perimeter zone depths up to 30 feet. It also increases the productivity the occupants inside. In the case of large atriums and entrance lobbies with large interior floor areas and with over 15 feet glass height, day-lighting can reach perimeter zone depths of 30 feet and more. If glass height is skyhigh, the entire indoor space is the same as the outdoors in terms of day-lighting. There should be no perimeter zone depth limit for day-lighting. It depends on glass height and percent glass. The 70 story IBM building is glass office building designed by Mies van der Rohe (1960s). Marina Towers is a residential building designed by Bertrand Goldberg (1960s). Marina towers envelope is all glass except for the door to the balcony. Both buildings were designed more than 50 years ago. The new 96 storey Trump Tower by SOM (Adrian Smith) located east across the street from the IBM building is an example the modern glass high rise buildings using efficient construction procedures.